*See additional comments in Taxonomy. Characteristics: Tallest mammal. Long, prehensile tongue. Large, hooved feet. Horn-like protuberances called ossicones on the skull; prominent in adult males. Pelage: Background medium-to-reddish brown, broken into characteristic splotches by buff colored borders. Ossicones: Permanent, bony, unbranched. Resemble horns, but not true horns. Soft and cartilaginous in newborns; ossify and fuse with skull during growth. Circulatory system: Adaptations to regulate blood flow to the head/brain. Unique heart structure. Special veins and valves. Range: patchy distribution in sub-Saharan Africa. IUCN Status: Overall: Vulnerable. IUCN recognizes some endangered subspecies. *Includes both current and provisional population estimates for G. c. angolensis; subject to revision. Activity Cycle: Active day and night. Most time is spent foraging, feeding and ruminating, sleeping, and moving. Sleep cycles not well understood in the wild. Social Groups: Social, non-territorial. Herd structure appears dynamic; fission-fusion. Associations may not be random. Groups usually 3-10 individuals, with large groups of more than 100 individuals reported. Locomotion: Walk alternating two right limbs, then two left (like camels). Gallop alternating two front and two hind limbs (like rabbits). Communication: Excellent vision; likely gain information from each other by visual monitoring. Varied vocalizations, but poorly understood. Evidence for vocalizations beyond human hearing range; growing evidence of infrasonic vocalizations/communication. Touch important in establishing dominance, courtship and mating, and maternal bonding. Diet: Browsers: mostly leaves and shoots; also, seeds, pods, and bark. Favor Acacia species. Sexual Maturity: males 9-10 years, females 4-5 years. In the wild: males, estimated average 14-16 years (21-22 years maximum); females, estimated 28 years maximum (average lifespan not known). In captivity: 32-40 years maximum (for females). Giraffes are the tallest mammals in the world. Closest living relative is the okapi. Evidence of captivity dates back to the 14th century BC. Coat pattern, patch color, and lion claw scars are being used to study in giraffe ecological studies. Giraffe in Niger have a taste for farmers' cowpeas and mangoes. Some giraffe "hum" at night. First pair of giraffes, "Lofty" and "Patches," welcomed to the San Diego Zoo in 1938. Today, to feed our giraffes, fresh acacia branches are picked from plants on Zoo grounds. San Diego Zoo Institute for Conservation Research scientists are working with Kenyan pastoralists to protect wild giraffes. © 2016-2018 San Diego Zoo Global. Population estimates and IUCN Status updated Nov 2018. How to cite: Giraffes (Giraffa spp.) Fact Sheet. c2016-2018. San Diego (CA): San Diego Zoo Global; [accessed YYYY Mmm dd]. http://ielc.libguides.com/sdzg/factsheets/ giraffes. Many thanks to David A. O’Connor for providing expert content review of this fact sheet. As a Research Coordinator with the San Diego Zoo, Mr. O’Connor spends much of his time in Africa, leading field-based giraffe conservation efforts for the Zoo’s Institute for Conservation Research. He also serves as a member of the IUCN SSC Giraffe and Okapi Specialist Group. Another focus of Mr. O’Connor’s work is collaborating with communities in Southeast Asia to reduce wildlife trade demand. For both programs, he works closely with in-country collaborators and partners. David O’Connor, M.S., earned his bachelor’s degree in Zoology and Earth Science from University College Cork, Ireland, his graduate diploma in Business Studies from the Smurfit Graduate School of Business at University College, Dublin, and his master’s degree in Conservation Biology from the University of Michigan. Visit the Institute for Conservation Research’s website to learn more about Mr. O’Connor’s work in community-based conservation ecology. Also, thank you to Amanda Lussier who shared her knowledge of giraffe husbandry for the Managed Care section of this fact sheet. 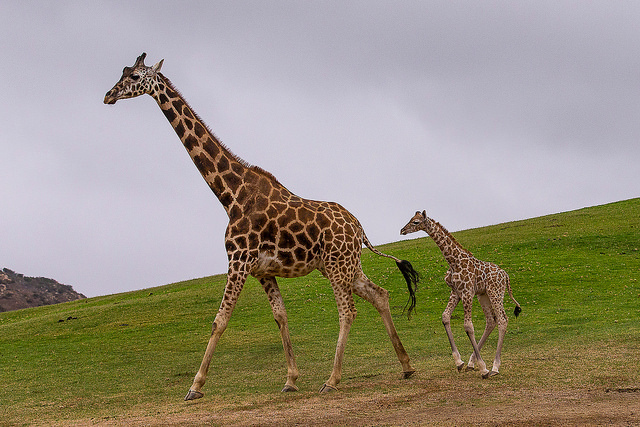 Ms. Lussier, Keeper at the San Diego Zoo Safari Park, has been working with giraffes since 2013. Her interest in these animals arose after hand-rearing a sick giraffe calf named Leroy. Ms. Lussier holds a Bachelor’s degree in Zoology and is particularly fascinated by giraffe social networks and herd dynamics.